New peripherals could turn your smartphone into a powerful camera. Sony may have come up with the next big idea for merging smartphones and high-quality photography. The Japanese tech giant has created “lens cameras,” leaked in a series of press photos yesterday, that are essentially lenses with built-in sensors and processors that can attach to a smartphone. Once tethered, using NFC or Wi-Fi, the handset’s screen becomes a digital viewfinder. The high resolution images were leaked by SonyAlphaRumors, following some very low quality mock-ups that showed up online last month. Making yesterday’s leak even more profound is the fact that Sony’s rumored 20MP “Honami” appears to be what the lens camera is attached to. Sony’s lens cameras will be offered in two variations, reportedly dubbed the DSC-QX10 and the DSC-QX100. “The [DSC-QX10] will be the pricier big boy of the bunch. It’ll hit shelves packing the same 20.2-megapixel sensor and Carl Zeiss glass found in/on Sony’s powerful RX100 Mark II compact,” stated PetaPixel. The RX100 Mark II is considered by many to be the crème de la crème of compact cameras, with its one-inch Exmor R sensor and f/1.8 lens. “The [DSC-QX100] will be the smaller, more affordable option that will feature an 18-megapixel 1/2.3-inch sensor and 10x optical zoom,” PetaPixel continued. 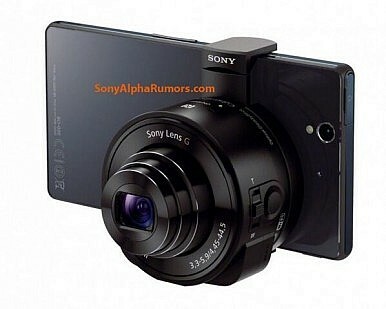 It will sport a 10x zoom lens, similar to the Sony WX150 point-and-shoot. The RX100 Mark II and WX150 retail for $600 and $400, respectively – a possible indication of what kind of price point these lens cameras could carry. Each of Sony’s purported lens cameras will be equipped with a Bionz processor, Wi-Fi/NFC connectivity, and a SD card slot. They will be compatible with both iOS and Android devices – not limited to Sony smartphones. It also appears that the lenses will mount magnetically. With smartphone makers releasing high-megapixel, photography-oriented handsets like the 41MP Nokia Lumia 1020 and the Samsung Galaxy Zoom, the DSC-QX10 and DSC-QX100 could potentially fill the gap between strong phone-based cameras and professional full-sized shooters. “With these new peripherals, Sony may finally be able to help amateur photographers close the distance on the image quality of a DSLR with a smartphone or tablet,” said TechRadar. Official announcement seems imminent after power button photo appears online.